The following was my comment at keshi recent post and thought to make it a post here and it was just fun play to simply say which words are male or female, and to reason why they’re. And I just wrote what comes by mind at that moment. Just fun alone. Surgery – Female, even through surgery we can’t see what’s in there mind. Keys – Female, in most of the homes it hangs on there hips. Water – Female, since there’re more rivers in India having female names, and the way women carries the water in pots on there top(head) looks beautiful and we also know they bear so much struggle every day then and now to fetch water in pumps and lorries. Sound – Female sounds sweet and they have beautiful throat to sing and I don’t tell males aren’t. Banana – Male, I don’t like bananas except the hill grown and I see most man eat banana. TV – Female, and the other meaning of TVs are now mega serials. There’re lots of homemakers in this world addict to mega serials and I wish these idiot boxes closed soon, before people become quite idiots. Money – Males go behind it always to satisfy there females and children. Tummy – The inseparable part of males easily. After the boon of TV, computers and IT sectors, the age has swept away in falling tummies. Trains – Female, as they pulls their whole family in order on a track, and any male would derail seeing a pretty women. Hollywood – Is there anything attractive than females? And the city where Hollywood itself has a link with Angeles and how angels could be a male? Kiss – Anyone would get kiss and all kisses would never be like given by our mother, girlfriend and lover. Every kiss has a sense of love and we almost get it from a female. Window – We cause to see nature as women, since she gives birth to human. I often see nature exist outside my widow and my admiring moon is described as a woman, who is a Female. Work – Male, it makes him sustain and creates a pride in this world. I do feel many times when a working person gets prior than me. It also keeps male from thinking about women. Life is like walking on a wire and its tough balancing without falling down either. Alike, my life could be easily compared with those walking on a string to adequate there life partly. Many a time I have seen in amuse at people waking on a string that tied between two sticks on road sides, but never realized it like lately when I face something similarly on surface to sustain pace. I’m trying my best to do better performance at paces but I’m inadequate with energy and strength to put few more steps, and what I like to express can’t be understood by anyone and my conflict is nothing concern them. I know I’m not to expect to address my conflict often and it might irritate anyone, thus my problem is unnoticed or unconcerned. I’m not looking for sympathy, but I need my anxious to be addressed and I’m not a human to sustain constant at anyone’s instant. There’re people who suffers more than myself in this world, but still I’m a normal being to think my trouble is the precious. Gradually I sense my world is shrinking and I’m trying to expand it deliberately, but none know what’s happening with me and still keeps thinking in belief that I’m constant and sustain forever. I can’t even tear drops and just don’t want to say something to make someone feel emphasis, reflects myself in stress. I could sense a lot of difference and difficult in my every activity lately, but I can’t do anything to keep sustain except my exercise, since the disorder was such essence, I solace myself to accept whatever comes my way and I still believe to live my life’s full phase. You know I love a lot to live and even thought I sense sometime selfish, I think why I should feel when my self wasn’t good and it was humans right to live to make significant the birth. To say certainly, my blog world isn’t set apart from this inadequate sustain and therefore I can’t be alike before here. Right moment both my reading and writing(typing) became slow and continuing so, takes much time to adequate either and at same time every other activity instantly struggle, I work hard a lot to keep in touch with every other sustain. Its not long back that I would finish a book less than 5-6 month, to the maximum pages of 600, but these days its impossible and I was interested in reading to extend my existence, and it faces hard time these days, but still I hope to adequate and keep it constant beyond disbelief. There’re few things that sustain me, hence reading and writing occupies me more. Ones I used to type well and it helped me to work with a publication and for some reason I dropped doing it. Later when the publication contacted me again and even some other offers comes my way, I wasn’t able to replay thus I’m not sustain the way I was then and lately I sense more diminish. I just need no sympathy here or wherever, but my struggle has to be addressed and my position to be recognized for being inconstant, and if not here where am I going express my sense and desire. These days I really think those alike me had to be brought to worlds view and thus people could obvious us, and what we live is no mans imagination and we aren’t the normal disables. We’re coved by dark shadows and only profound torches of thoughts and emotions could find us where many bright hearts and thoughts shine in between struggle. Will the world listen to us and recognize, when our dear and near ones can’t? Alike a typical boat that gently floats on the Dal Lake of Kashmir. The culture symbol of Kashmir is now adorning the Kodai Lake. Many of us, who can’t makeup to Kashmir and dream alike sailing in Shikara on Dal Lake, would perhaps get a chance to enjoy it likely on the Kodai Lake. And I liked to call the lake as Dal of Kodaikanal. 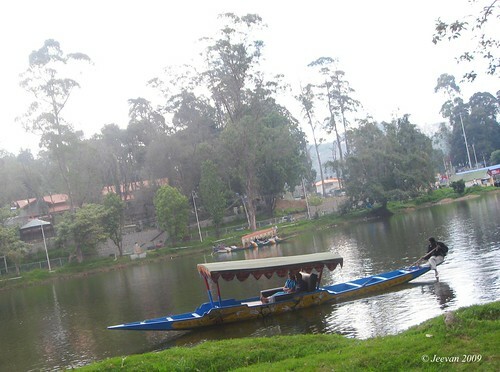 One pleasant evening, I come around the bank of Kodai Lake to see a Shikara sailing close to bank with a couple inside. It was moving and seems like there aren’t many boat of this type on the lake and like ever seen before, I thought to capture it without delay. So I took the cam and clicked. But it unexpectedly thrown flash on the boat and the couple inside gazed in surprise disturbed the moment, but still I don’t want to miss the chance clicking at the boat, hence the flashed one isn’t clear. I just came down to manual and clicked again, leaving away hesitate and still stared by either. Leaving away the couple in clam, the rower sits at the edge of the boat and rows with an oar and leg down touching the cold lake water. The oars used in shikaras are shaped in a unique spade bottom! A usual shikara seats half-a-dozen people with rower sitting at the lower end, are still used for fishing, harvesting aquatic vegetation and transport to the deeper parts of Dal Lake. Mostly covered by tarpaulins, protect tourist from sudden shower and also remain as floating homes to poor people. Shikaras are the main tourist attraction to Kashmir’s Dal Lake and interestingly it seems shikaras are available only in Kodai Lake outside Kashmir. Coaker’s walk and Pillar rock! I’m swing in bliss, because its mist. 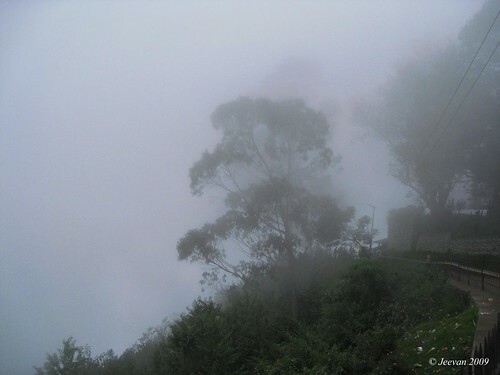 For everyone kodaikanal mean something and for me it’s totally mist, and lately the beautiful lake. One morning I went on wheels through Coaker's walk and it was completely covered in mist in a disappointing way to everyone in getting views, but I really enjoyed a lot like on one and leisurely moved with cold mist. Entering either way, the small tea stall at entrance greeted me with memories of having cuppa at couple of times in past, the taste and warmth comes to sits at my tongue. Further moving into the path way that goes along the edge of mountain and half a km in distance, it was quite bliss with cold breeze and mist like ever sensed before. Along the way there’re countable pavement shops selling fury toys, wooden decorative items and photos adding on cups… but nothing interest me like mist, except few wooden cars in a shop and baked peanuts. Coaker’s walk always interest me at leisure and passing through this lane is simple pleasure and unvaried sill. The panoramic view of beautiful valley, with clouds floating sometime, to far away towns, lakes and hills are indeed splendid on a cloudless day and it’s a view point unlike others almost covered in mist. Telescope tower at one end of the path gives a chance to see far away places at close distance, but I wonder why do people pay and look through the lens when white screen confined there views in mist. 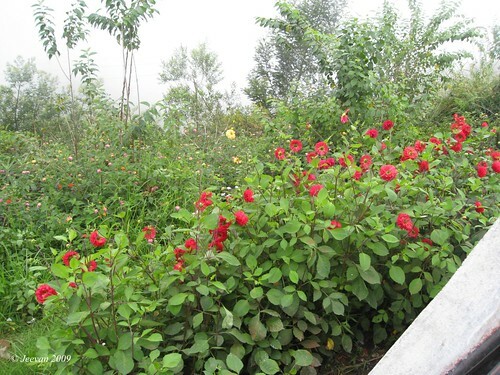 The flowers grown beneath the slopes in red and yellow are very pretty to see, including the hanging flowers in white and pink at one end. The Coaker deriving its name from Lt. Coaker, who discover this footpath in 1872 and drew map to kodaikanal, cleared my query at last. After wander at Coaker’s walk our next stop was at Pillar rocks. At 400 feet height, three rocks stand proximately is one of nature’s wonderful formations. The chamber between the pillars is known as devil’s kitchen – a hallow cave, also known as guna cave. The pillars are often covered by mist and as usual the clouds played hind and seek with us leaving little space to cover the splendid. But what disappointed me a lot was the situation of pillar rocks lately, with many shops shifting the place completely leaving behind a hard sign and sight of pillars. I see how people are such follies to turn over the significant of this place, and I just wanted to ask those shop owners, do we came over here to see the arrangements of your shops blocking the pillar rocks? Kodaikanal, being one of the important tourist place in country, it’s damn what the government is doing than cleaning these encroachments. I would say princess of hills losing her beauty to encroachments of buildings and shops, and ones the pristine beauty is polluted now somehow. Today was total solar eclipse and we all know it’s a general occurrence by nature, even yearly we have eclipse this time it was a rare event that last the longest of 21st century. This doesn’t make me awe and as usual we expected the sight was blocked by clouds, and what really made it special was the total eclipse almost across India. But what I like to say about was belief. In whatever manner the scientific knowledge and understanding grows, but still people believe that moon hide the sun on eclipse and reflect its shadow on earth is devil caught up with evil. Eclipse might be believed or described as bad omen in earlier times when science wasn’t understood, but even after many years of man landed on moon and well aware about universe, few people still believe in things that has no meaning and existence. 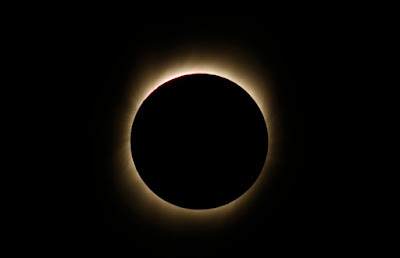 I just wonder in disbelief at one of my cousin’s act upon eclipse and what she did in name of belief. She ate a day before eclipse, by 6pm in evening and went on fast till midday. I have heard people saying in past that eating anything at the period of eclipse won’t digest, but what she did is simply foolish and being educated. I know education and belief are something distinct and I like to see sense and knowledge on both. Then, there go the astrologists making certain promise that something gonna happen to earth on the time of eclipse occur and possibility of earthquake or tsunami. But I’m not sure those astrologists truly know what tsunami means before the December 26th incident? We know the earth stability is because of some gravity force from sun and when moon come across, a question could rise on the changes of substance, but obviously there haven’t been any incident happen so far on eclipses. There’re times people have been saying and following the tradition of taking bath after eclipse are over. As a child I have also conveyed the same by my parents and those days we never ask why and just follow what parents say. I have heard mom saying that people also wash there homes and drop whatever is left to feed and cook newly dish after eclipse, and we were never allowed to go out in times of eclipse. I feel it’s simply offensive to follow these and I see in disbelief people used to practice it deliberately. Don’t we realize to change ourselves with what we got in knowledge? And if we don’t want to turn the illusion, then why do we need to learn new things to develop our sense and knowledge? And the important thing of learning is to drive folly. Sunday marked my great grandmother’s first Memorial Day, and at home there was an oblation to mark the day and except dad, who reminded by her last moment at hospital was most strike me, but I couldn’t sense anything great more about my grandma on this day and I hardly come across by her thoughts. That’s nothing mean she isn’t so special to me to remember, but when did I forget or miss her to remember. Though I feel her disappearance was only in physical, and mind really stable at sustain that she lives somewhere and connected forever. Few people asked me did your grandma come on your dream and I said no, and it was not in my wish or right what dreams should exists. She was the most caring person in the world towards me and no grandma is exception to this emotion. Even she was old, she was my good companion on times being alone and no one at home, in case of unavoidable circumstance. Recently I remind her more and felt bad being missed, leaving away whatever I feel sustain about her through mind. There’re moments fragile between us or anyone at home, but it never last more and simple words are enough to cool her and she always want someone to care for her and being enquired often, to get replayed the most not bad. We can’t accept the instant depart of someone lives throughout our lives and there was no sustain feeling of being missed unless deep sense. She wished to travel and see few places at catching distance; including the one was MGR grave in Marina beach. Thinking her health condition we don’t take her out often and it was still the hurting thing that we can’t even fulfill her little wishes and dad really worry saying this sometime we move around. To my memory, the last time we took her out was to her native village few months before her depart and surprisingly we made a visit to her village on the same month this year brought back those memories. She was an adherent fan of Chief Minister Karunanithi and believed whatever he do is good for people, and she also openly supports his part and gets argued with us. She loves comedy and her favorite ones are Vadivelu comedies; and if she sees him on screen, she sit back and enjoy, and also scold us sometime if we turn channel or disturb her views. She is so much attached to our lives, and it’s hard to believe she is departed and would be remembered not alone on a specific day or moment. 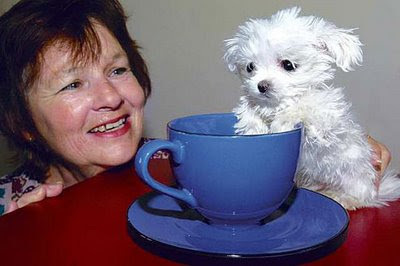 Like a tiny doll in white fluff, just 3.2 inches tall, the Maltese pup reached just more than a height of teacup is among the world’s smallest sleeve dogs. Scooter, the six month-old pup, is also weights less than a block of butter at 400gm that too while wearing clothes – a regular purple sock jersey, so that she is seen easily around the home and to prevent inevitable injury that would result at a wrong step. The owner of Scooter 'Cheryl McKnight of New Zealand’ says the pup feeds from an egg three times a day and sleeps in a shoebox, does everything a normal dog does. Another tiny pup vying for the status of being smallest in world is Tom Thumb. Even he is younger than Scooter, his owners convince he’ll still be shorter than the current record of smallest dogs by length when he’s an adult. At three weeks old, Tom Thumb measured less than 4 inches from nose tip to tail tip; and is believed to grow more than an inch or two. Beyond anything astonish, these diminutive dogs are absolutely cute and I know u too will agree. The tiny scooter reminds me of maya, while she was alike when she was small with those pretty eyes and nose. 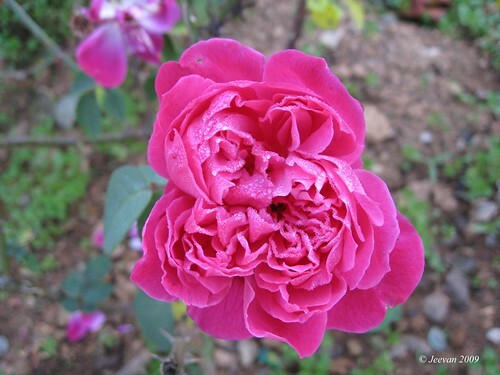 At end of May the tree stands bare without leaves and I was worried looked at either shrubs bloomed in flame of red. But in its development as a tree, against my home, I was pleased by its first appearance of blossom in mid June. I once wondered would this shrub relive after the total destruction by a bulldozer on behalf construction and to my surprise it began to grow more than enough to give shadow and wind. I thanked whatever stopped the land owners to go further into there plan and I could say this shrub is also one of my source of energy, and I see often in morning or evening the koel chirp sweet as it is belong to its own species sitting on this tree. The squirrels run and play on its branches and left stand to few water birds, and its home to a lonely jangle crow, which sleep all nights on this tree. 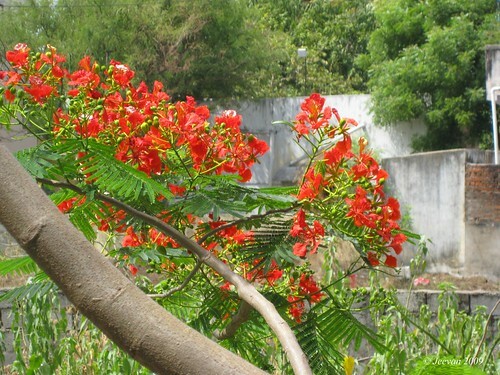 Now the tree has bloomed in flame of red, and I see Gulmohar adorn our resident and complete with gesture that detained these days. Getting into some detail about this tree and flower, it was discovered in early 19th century in its native island country Madagascar, by botanist Wensel Bojer and it named as Delonix regia. Gulmohar is a flamboyant tree bloom with flowers for several weeks in spring and summer, and being pretty it is viewed as world’s most colorful tree. The trees fern-like leaves are composed of small individual leaflets and fold up at the onset of dusk. Looked like stretched feathers it also known as peacock flowers. I went to drive-in at weekend and saw a wonderful Tamil movie Naadodigal (nomads). It’s a movie about friendship, where we get to see some of the best and worst in friendship. They have shown a group of friends to do whatever to there friendship and kept strong the promise that a ‘friend’s friend is also a friend’, as the title note says. It begins like a usual movie of friends being free birds and does things unemployed do. But the difference is the way of understanding between friends and interesting screenplay that turns over there lives, in need of helping a friend to get his lover. Sasi Kumar of ‘Subramaniapuram’ led the movie with his matured thoughts as Karuna and the way he conveyed his expressions, want us to look into more. Being a hero he never displayed unbelievable talent and did what he can; with two other main characters played by Kalloori fame Bharani and Vasanth Vijay shows success being unfamiliar, and it’s what the kind with every character plays of real life characters make the movie live. The style of language spoken by Bharani as Pandi is easy to remind and whatever he does mix with humor. His silent expressions are woven into suspense and merry emotions. The new faces act as Karuna’s sister and sweetheart are beautiful whatever aspects they do, and Ananya(heroine) has a bright visage in acting, with her pranks and next door looks. Though the movie gives a feel of gilly, this was based on friendship and it was something rare to come across friends, who see the relationship as more than anything in the world. There suffer are tough touching when rescuing the lovers and burst out when came to know their sacrifices are no means, exists well into flame. The background scoring was excellent and it increases the furious on screen esp. on chasing scenes it’s remarkable with ‘sambo siva samba’ vent aloud and camera captured the namakkal sequence well. In a line I like to say Nadodogal, oodivanthu uthavum nanbargal (normads, are friends who run to help). Based on this subject, I watch a program ‘Neeya nana’ on Sunday night and it was about what friendship means and what’s the boundary of it? The chief guest of the program was the director of Naadodigal ‘Samuthirakani’ and what he says is friendship has no boundary and any relationship would fail to succeed friendship. the other side of the team argues that friendship has a limit and few said I will allow my friend only up to my gateway and set of friends until hall. And in my view what I see boundary is in understanding and if there was the thing understanding, none need to draw a line, because they will know better how one would feel extending certain limits. Sometime I also think how would be the countries like India and Pakistan if there was good understand and love among our people, and the fence and armies are removed where the line of control under understanding. # Current one is a festival song from Naadodigal. See video song at right! 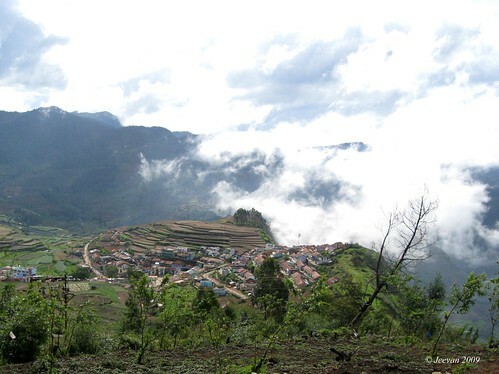 Mannavanur is a beautiful landscape, situated at a distance about 35km from kodaikanal, is surrounded by grasslands. I heard about this place for very long time and got the opportunity only now after missing couple of times in past. 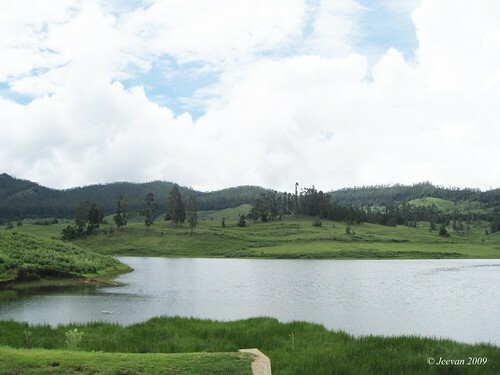 The Mannavanur Lake is the heart of the place, which could be sighted as soon we enter the huge landscape route. It’s a wonderful view of grass mounds across the valley and water as its center of attraction and surrounded by hills, and little blue sky gives way to picturesque shots. 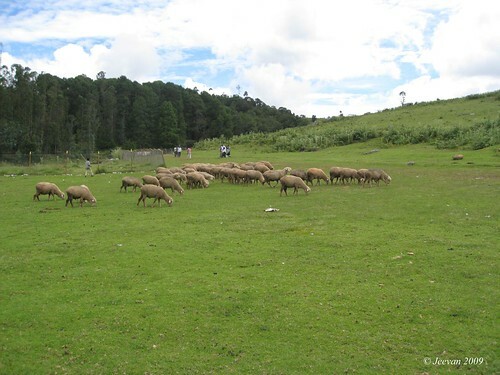 Mannavanur is also a village, mainly depends on terrace farming and agriculture alike Poombarai and holds a sheep research center. 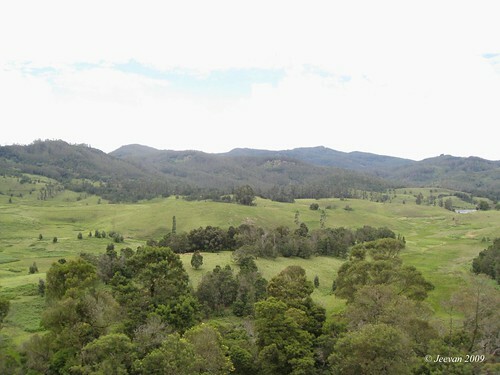 And mannavanur is also called as Bison valley. On the way we could see a group of sheep grazing at distance and wished I could be there, but as we moved further the sight disappears and we came across the village and farm lands, particularly an oval shape field looked like a playground stadium, where rows of steps lead to ground. 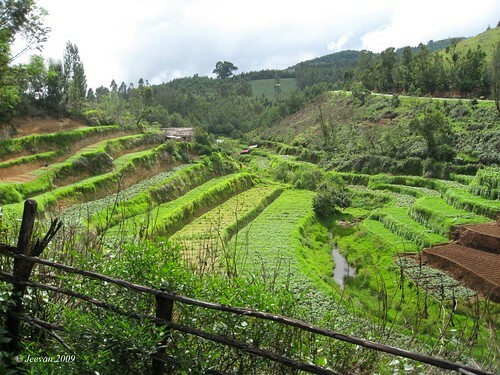 Various vegetables are cultivated here including broccoli, French and butter beans, and the village also provides home made dish to those approach them, even rabbit meat is cooked if requested. There is no particularly place to attract tourist, but if someone is interested like us can go up to the lake leisurely through meadow path, coming across grazing sheeps and rabbit form. I had a wonderful time wandering at meadow, getting near sheeps and stream that flows from lake, to the vegetable fields nearby. The mounds of green and chill climate never want me to leave the place, but few members of my family left in hunger drive us to vehicle and the gateway to lake doesn’t seem welcoming in debris and miry. But lake area seems untouched and undisturbed, which is a source of drinking water to the people live less than 100 meters elevation. We moved further away from the place and after the lunch I climbed some distance on wheels along the road lead to kavunji, another village in this region. I found it was quite silent except the vibration of spraying medicine at fields and the compound of green brown terrace just caught up the eyes. The clouds gathered around the place turned the moment into perhaps rain and so we left before evening. On our way back we stopped somewhere in between pine forest and looked for a falls we found in past, but we’re at wrong indication and even warned by the one who guide us, few of them get down and stick with leeches and unless reaching room none could find it was sucking blood. I was bored to get down into cottage, so we went to the lake bank and spent sometime watching the reflections of light and went around the lake in car which was 6-7km in length. 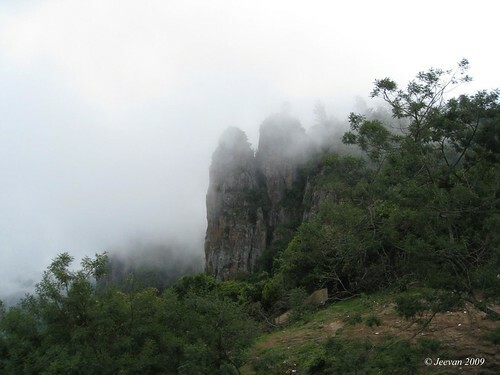 The place we decided to travel first after arriving kodaikanal was, Poombarai. 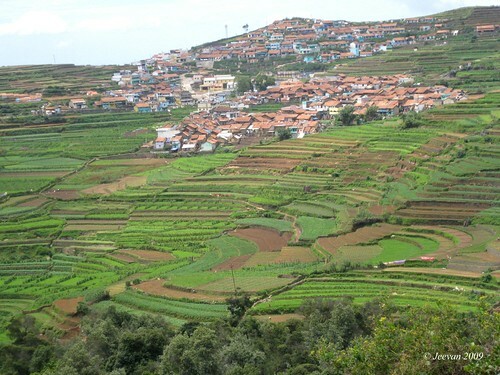 It’s a beautiful village, with an hour drive or 18km from kodaikanal on the way to Mannavanur. It turned noon when we were moving around with couple of restaurants to get our lunch parcels to only get a replay of no after making delay, and the places we like to go further have no provision of food, so we just gone with bread and jam to stop some more delay. The route we went take us through pine forest, where woods laid nearer in order by nature or whoever, stands tall in almost wet surface, just makes cool like anything and ever green. The fallen woods that remain after removal from way are tuned to live within nature simply getting to ruin to feed nature and they say these woods are banned to remove from here and this one reason helps nature to bounce within at least. We had nothing to do with the village Poombarai, but it does everything with its pretty views I have ever seen that make impress with the pattern it provides. Parked beside a curve road that gives a clean sight of the valley, we saw the beautiful village surrounded by different shapes and size of lands that carved like steps on the slope of hills and it was well known as terrace farming. 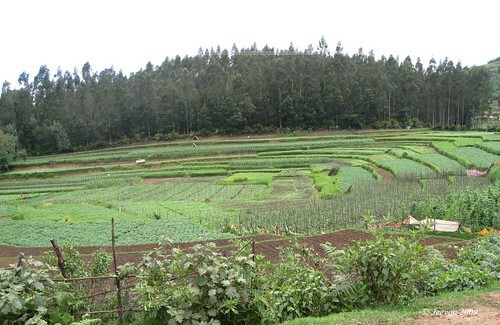 One part of the fields in different soil colors, gives a wonderful pattern and few terraces are traced by ploughed and harvested, with remaining terraces into the progress of developing cabbages, carrots, cauliflowers, potatoes and hill garlic, which is noted here. Almost with tiles roof, the houses seem even at distinct. The valley that exist other side of the village is wide open to an excellent view of Palani hills where Poombarai situated as its heart, a mountain range in Western Ghats. 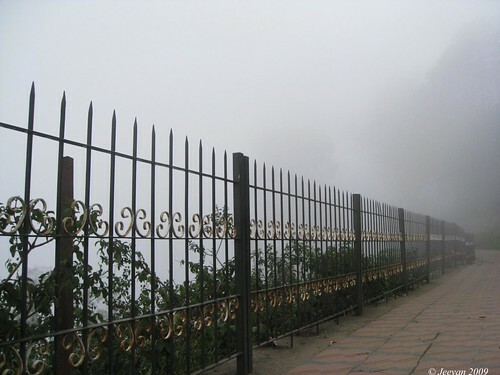 There’s a wooden view point adjoin to the road side, to climb at our own risk and there’s a small hill top with shrine, where one could enjoy the cool mist and breeze that moves into peace and pleasure looking over the village. At far distance there was a falls flowing like a silver line and as far we move, the view continues along the way; and it was interesting with fresh green vegetation fields. The irrigation was done through a small canal where the spring water collected from nearby areas passes through and wonder how water supplied to the higher terrace when rain fail to visit. And back in evening, it was another splendid view of mist covering the valley and slowly caresses the village. I wonder how the people would feel being under blanket of mist and just being hidden from the world view for sometime to clear. 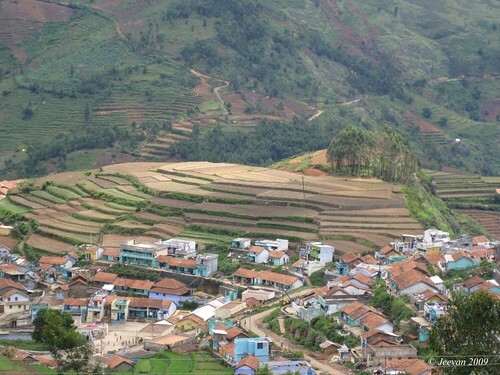 The village exists like an untouched beauty as its core attraction, with petal like hills surrounded. It was nice to see them farming even on no flat surface and creating something to progress their lives, and not like those people who sell there well growing lands to more money and turn it to concrete floors in name of development. We come across many farming lands, but this was simple marvel. The village is connected with buses from kodai and it was a remote village with no clear signal of mobiles, and it holds a Murugan temple with history of three thousands years and once a year they celebrate cart festival after Thai Poosam that comes in Jan-feb.
Dear Anya tagged me just for a play. She is someone very sweet to tag me into this game and she has a beautiful cat named Kareltje, and her blog is almost about her pet and none can beat her in receiving awards from friends. Anya had brought her pet Kareltje’s picture on her tag post, so I thought to break the rules so that similarly I can also post our pet maya’s picture. Thought the rules are to open your photo folder and select the 6th folder, and then select the 6th photo in that folder and post that photo along with the story behind it on your blog and tag 5 people. The picture above is maya. The time I shoot this picture was about 8pm on a rainy day and u may think what her position stands for? One thing I haven’t said before was, maya was a superb hunter of ants. Now u may know for what she is waiting near the door. 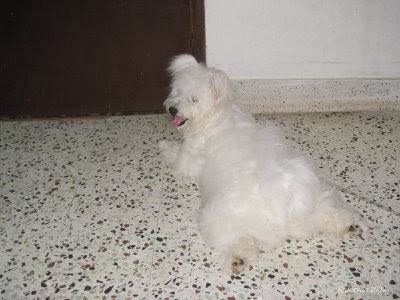 Sometime ants used to enter our home in-between the gap of door and she would wait for them to arrive to catch and eat. One day a leech entered through the gap and maya seen it and started to bark aloud and before she catch we drew her away. From then on, she used to keep her face down near the door, so that she could catch anything that comes. But something opposite to that happened to her recently and what it was a leech had been biting her leg for sometime when we were in kodai and we only saw it later bleeding. Even couple of our family members got sucked by the leeches when we visited a pine forest.